While the demand for the latest batch of 10-year bonds was higher than November, it was far below the usual standard. GERMANY HAS SUCCESSFULLY raised €5 billion through the sale of new 10-year bonds – the first bond auctions of 2012 – but has again seen its benchmark debt meet with weak investor demand, sending the euro close to a 12-month low. The €4bn of bonds, maturing in early 2022, cost the government just 1.93 per cent in annual interest (down from 1.98 per cent) – but with the demand for the bonds still only marginally above the amount of debt on offer. 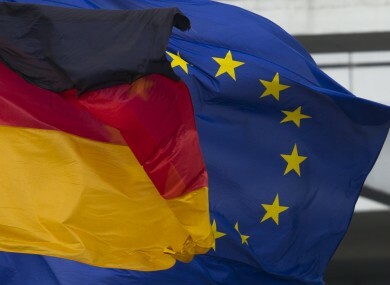 Investors had submitted bids for €5.142 billion of bonds – enough to cover the €5bn target – but the bid-to-cover ration of 1.03 was unusually low, and far lesser than Germany had expected in previous auctions. The amount was lower even than at the last German auction in November, where the ratio was 1.1 – though in that case, the amount of debt being rolled over by Germany meant that its Bundesbank had to step in and buy around tw0-fifths of the debt on offer. The weak demand may have been caused by investors anticipating a low yield; while Germany is seen as a ‘safe haven’, the interest rate is now lower than the German rate of inflation, meaning any investment would be worth less in ten years than it is now. The auction is the first in a crucial fortnight for the eurozone’s major economies – France is to issue €8 billion in new bonds tomorrow, while Spain and Italy will issue bonds next week. The euro fell on the back of the poor auction, falling to $1.29 against the US dollar – nearing its lowest value in a year. Email “Euro nears 12-month low after poor demand at German auction”. Feedback on “Euro nears 12-month low after poor demand at German auction”.